We eat condiments. We review condiments. You eat condiments. I'm not a huge fan of single-task kitchen gadgets (I'm lookin' at you, mechanical egg cracker), but I do appreciate anything that will make my BBQ easier and allow me more time at the grill. 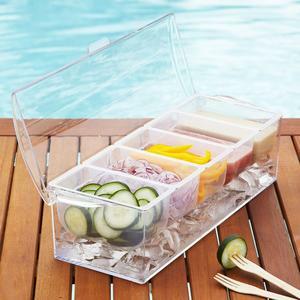 The Condiments On Ice tray from Sur La Table looks to be the perfect solution for keeping your grill accoutrements fresh in the hot sun. You could even use it on your bar for cocktail fixins'. At $17.99, it's probably the cheapest thing you can get from Sur La Table! On the Seventh Day, God rested. We like to think he probably had a few hot dogs...and you know he didn't eat 'em plain. Nope, God is definitely a Sabrett's Onions and Bone Suckin' Sweet Hot Mustard guy, which pretty much means he's cool with us.